About Us | Miami Accident Attorneys Gerson & Schwartz, P.A. Contact Coral Gables Personal Injury Attorney Gerson & Schwartz, P.A. Gerson & Schwartz, P.A. is a full service personal injury law firm located in Miami, Florida. Our attorneys have extensive experience representing people injured car, auto, and motor vehicle accidents, motorcycle crashes, truck accidents, drunk driving accidents, cruise ship accidents, maritime accidents, slip and falls, medical malpractice, premises liability, and violent crime cases. The firm focuses obtaining compensation for all serious and catastrophic injuries such as traumatic brain injury, spinal cord injury, burn injury, loss of limb, vision or hearing and wrongful death lawsuits. The firm's most senior partner has practiced law in Miami, Florida for over 45 years. For a free initial consultation, call (305) 371-6000 or toll free at (877) 475-2905. You can also contact us online at info@gslawusa.com. Our firm is proud of our reputation for professionalism, our distinguished track record for outstanding client results, and the recognition we have received in the legal community. Our experienced litigation team is supported by a paralegal group which has worked with us for many years. All cases are carefully developed so that our courtroom presentations are powerful and effective. Starting immediately after we are retained our message reaches out to opposing attorneys, insurance adjustors, judges, and ultimately jurors. We maintain strong relationships with nationally known experts in many fields of medicine, mental health, law enforcement, accident reconstruction, management, engineering, security, maritime, rehabilitation and economists to provide evidentiary opinion support for our client's claims. Highly skilled and professional legal services require a law firm with substantial resources to develop and present comprehensive and convincing evidence in court. Responsiveness and commitment to our clients and the victim community are the hallmarks for which our law firm is well known. Over four decades of experience brings us to the 350 jury trials which can be matched by very few law firms. This track record evidences our experience and determination to obtain justice for our clients. We don’t cave in and recommend settlement unless it’s in our client’s best interests. Corporate businesses and insurance companies know we won’t stop until our clients get the compensation they deserve. Our policy is not to delay. The first priority is sensitivity to the needs of our clients. Often we advise our clients to sue first and talk later! We understand when action is necessary to stimulate settlement conversation. We want to get our message across at the soonest possible time. We provide aggressive, ethical, and thoughtful legal representation for all our clients. Our doors are always open and we welcome you to visit our offices so we can answer all questions you have. We will listen to you and learn the facts. When you leave our office would will understand what your legal rights are and how your goals can be accomplished. Our community contributions extend beyond the courtroom. Presentations at conferences, legal publications, pro bono work, leadership and services provided to non-profit organizations even reach the classroom. While other law firms accept all kinds of cases from contract disputes to bankruptcies, we limit ourselves only to representing people harmed by the fault of others. We will retain leading experts to prove your case and recover all the damages to which you are entitled under the law. Cutting edge technology is used into our practice and updated as it progresses. In numerous personal injury practice areas, we have pioneered case theories and courtroom techniques that other law firms have used after observing our successes. Hard work, truth, and persuasion are our courtroom tools. All of our clients receive the highest professional legal representation in accordance with Florida’s professional ethical standards and common sense moral principles. Thoroughness and Innovation — Our standard for every case. We follow every reasonable investigative lead, consult with the best available experts, and utilize the most current and innovative technologies to gain an edge over our opposition. With diligent preparation, many of our cases are resolved by settlement before lawsuits get filed avoiding the rigorsof a trial. In every case we pledge to fight as long and hard as needed to obtain full and fair compensation for our clients. Team Approach — Applied to every case we handle. Our clients are assured of having experienced lawyers and paralegals available to answer questions and solve problems. Most cases have more than one lawyer as well as at least two legal assistants assigned. Public Advocacy — We extend our voice for public service outside the courtroom with efforts to improve statutory rights of clients on political and legislative fronts. We are active at the state, federal and international levels of government and regulation. Community Involvement, Presentations, and Publications — For decades our personal injury lawyers have authored and presented to both attorney and layman groups. We hold important positions with nonprofit organizations which advocate for protection and expansion of victims’ rights. The " AV Preeminent” rating is the highest peer review rating for an attorney or law firm and our firm has been AV rated for over four decades. The ranting is given by the longest established and best known legal directory in the world. This recognition comes from attorneys at other firms who rated the attorneys at Gerson & Schwartz P.A. among the best. Likewise we have also received distinguished ratings in the South Florida Legal Guide, Super Lawyers, and other law firm ratings. Philip M. Gerson served as the founding president of the National Crime Victim Bar Association advisory board. This non-profit organization of victims' rights lawyers based in Washington, D.C.is affiliated with the National Center for Victims of Crime. The center has had a leadership role in the development of guidelines for the September 11 Victims Compensation Fund as well as for other mass casualty public funds. Mr. Gerson continues to serve on the advisory board and is a leader in the fight for protection of victims' rights. The firm is a stalwart supporter of this organization. Philip M. Gerson has served as a board member and also provides pro bono legal services to the Victims Services Center, a Miami-based nonprofit providing crisis intervention other support to violent crime victims. The Center was established to help victims recover from the effects of trauma and provides free services to crime victims and witnesses of all ages. Mr. Gerson received the Center's "Angel" award and was recently honored for its leadership and financial support. Philip M. Gerson was elected to the Board of Directors of the National Center for Victims of Crime in 2007. Since 2012 he has served as board chair. This well-known organization is America’s leading policy, training, and advocacy non-profit dedicated to serving the needs of crime victims. Leadership in the victims’ rights movement has been a priority in our firm for decades. We are proud of our role and the progress which has been made to enhance the rights and improve the treatment of crime victims. Our firm has contributed to scholarship in the profession by publications in respected treatises and journals. A few notable examples: Edward Schwartz and Philip Gerson authored chapter 5, entitled "Issues and Experts in Negligent Security Cases," to 2001 Expert Witness Update: New Developments in Personal Injury and Litigation, published by Aspen Law and Business. Chapter topics included legal barriers and the burden of persuasion; types of negligent security cases; proof of specific foreseeability; proof of general foreseeability; preventability and foreseeability; proving preventability; using experts to prove foreseeability and preventability; and types of experts. Philip Gerson and Ed Schwartz co-authored When Negligence Leads to Crime, which appeared as the cover feature lead article in the December 2002 issue of TRIAL, the Journal of the Association of Trial Lawyers of America (ATLA) now re-named American Association for Justice. In 1996 Philip Gerson’s Trial Magazine article has by the test of time been recognized as a blueprint for lawyers preparing security negligence cases. Law review articles and other presentations to lawyer and civic groups have helped to raise awareness and public understanding of the role of litigation in improving security and safety in public places in America. 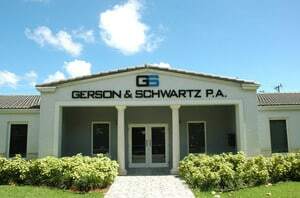 The Miami law offices of Gerson & Schwartz, PA represent accident victims and their families throughout Miami, Fort Lauderdale, and other parts of Florida. Our offices are located in Miami, near Coral Gables, and Kendall. We regularly represent clients injured in Monroe, Broward, Collier, Lee, and Palm Beach as well as other counties throughout the state. Frequently we work with co-counsel across the state in important cases. If you or a loved one has been seriously harmed through the fault of another you need experienced legal counsel. Contact us today.